By now now most people that follow me on Social Media will have realised I rarely blog, so when I do take the time & trouble to write one it's probably because I'm genuinely exited about a product. The last time I wrote a product related blog, it was for the newly released Format Hitech Firecrest Filter holder which was & still is a cracking piece of kit. A bit of background as to why this blog has actually come about. 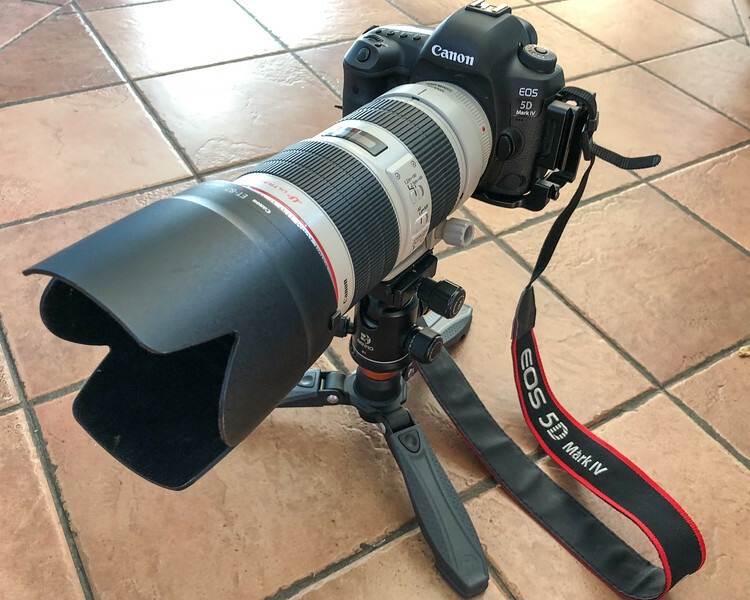 I've been looking for a mini tripod for a number of years that would be robust enough to hold the weight of my Canon 5D mk4 & EF 70-200 f2/8 IS L lens, which tip the scales at a combined weight of 2.7kg. Most of these mini tripods are designed for much lighter & smaller cameras & as such have proved to be woefully inadequate (yes Pixi I am talking about you!). The situation came to a head when I participated in the recent Photo24 Challenge in London and having weighed my camera bag & associated kit + tripod at just over 10kg I decided that was far too heavy to carry around London for 24 hours on a blisteringly hot day. So the Tripod had to go. This meant shooting tripod free for the whole 24 hours, which at times was pleasantly liberating, however, as the light started to go, shutter speeds were becoming slower & slower even when shooting wide open & increasing ISO. Therefore, my late night / early morning shots were pretty dismal & I had to resort to propping my camera up on suitable surfaces just to try & get a steady shot. Roll the clock forward 2 weeks & I noticed that 3 Legged Thing were advertising a brand new 'Monopod Foot Stabliser' called 'DOCZ' specifically for their new range of Monopods 'Alan & Trent'. I had a quick read through the specs & notices that DOCZ was rated for 20kg & the design was effectively the same as a mini-tripod. What was more interesting was that the thread size was 3/8" i.e. the same size as the thread to mount a ball head to a normal tripod. At this point , I took the plunge & hit the button that said 'Pre-Order - expected deliveries will be shipped on release date 1st August'. To say I was slightly surprised when a small box arrived 2 days later was as understatement, given by now it was still only 12th July. I hastily unwrapped the box to find a perfectly formed set of what I will now refer to as 'mini-tripod' legs. 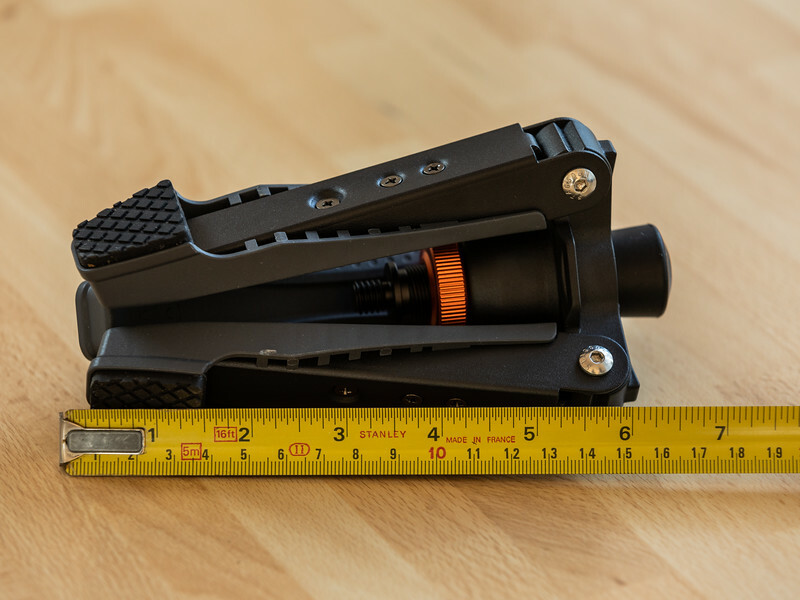 The build quality is absolutely fantastic, with the design being incredibly practical and also ingenious. 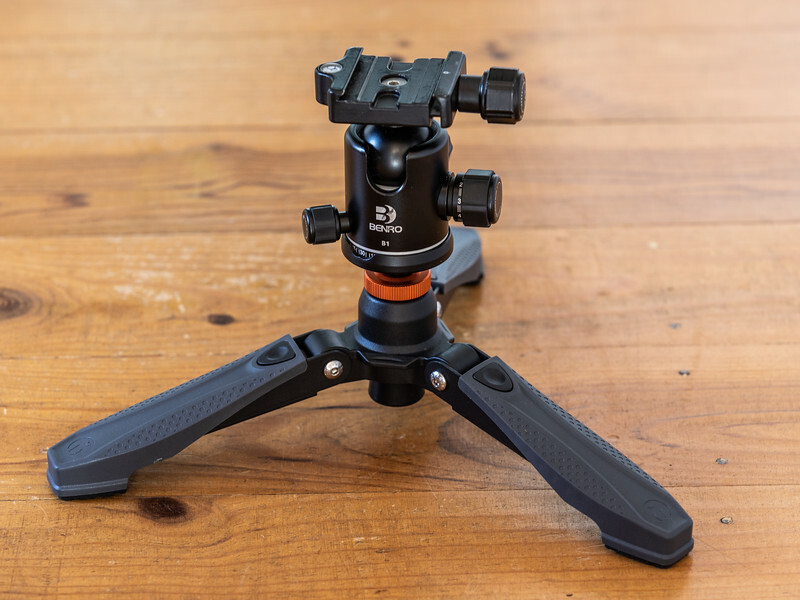 Most of the issues that come with the existing mini-tripod is that the supplied ball head or locking mechanism is not robust enough & when combined with a camera + long lens combination usually results in a camera that will just droop & therefore not allowing for a steady shot. 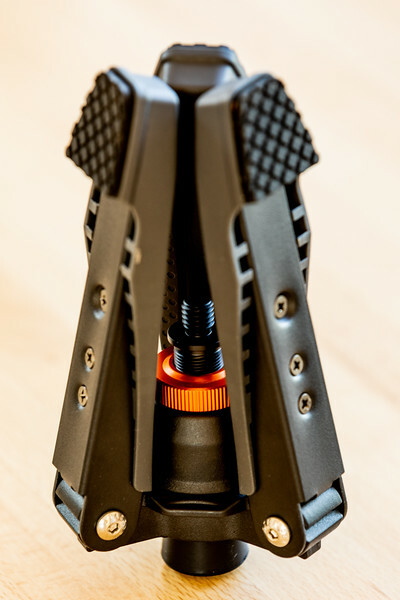 The locking mechanism of the DOCZ involves screwing down the orange ball at the top of the tripod until it sits flush with the holder preventing any movement, there is a secondary friction lock on the base of the tripod that further improves the 'lockability'. 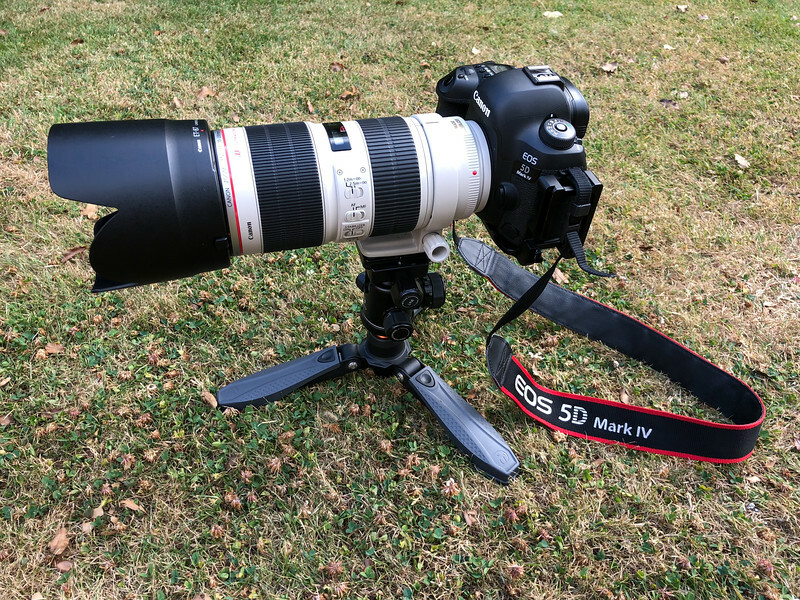 Having tested this with the 5Dmk4 & 70-200mm lens combo I can happily confirm that this mechanism works perfectly & the camera was absolutely rock solid. This is a major feat when you consider the leg footprint is only 30cm ! The height from ground when combined with my Benro B1 ball head is a mere 17cm, so absolutely perfect for low level photography. 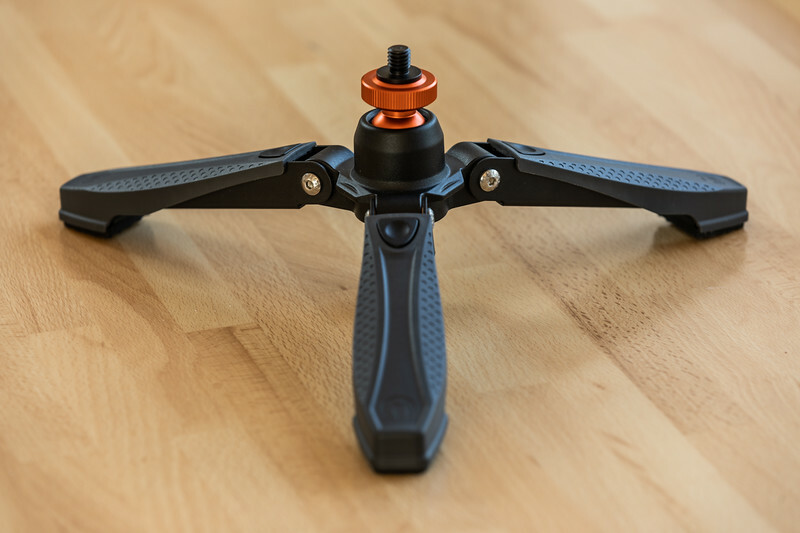 Another real benefit of the DOCZ is the ability for fold the legs back on itself, which allows me to keep it inside my camera bag & therefore reduced a huge amount of bulk. The small size also enables some more 'stealthy' shots to be captured where tripods are frowned upon (or prohibited) ***Disclaimer - I neither encourage or condone taking photos in these situations, but just saying that if you were to need a tripod based shot the DOCZ is far less likely to draw attention than a massive black triangle with a camera perched at the top. 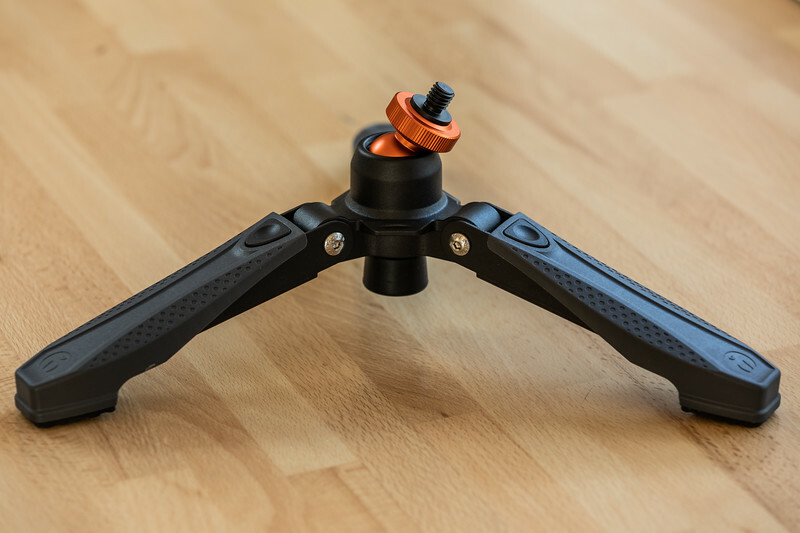 Conclusion: If like me you've been looking for a lightweight compact mini-tripod that can be used with your choice of tripod head then look no further than the DOCZ. Whilst 3 Legged Thing advertise as the Monopod Foot Stabiliser (which I'm sure it excels at) it comes into it's own as a mini-tripod. The listed price of £49.99 might initially put some people off, however, the build quality is exceptional & for me this just exudes quality. More importantly, this will allow to me to take shots I couldn't get without the use of a tripod in certain locations which together with weight & size reduction makes the price an absolute no brainer. Just to confirm, I have not been sponsored by 3 Legged Thing to write this review and as mentioned at the start a product must really excite me to get me to actually sit in front of my computer & pull together a blog! Folded length	165 mm / 6.5 "
Base diameter folded	90 mm / 3.5 "
Height in-use	90 mm / 3.5 "
Base diameter open	300 mm / 11.8 "